Habit: Generally perennial herb, generally erect, generally with long, scaly rhizomes; stem, leaf generally with air cavities. Stem: simple, smooth, (wiry). Leaf: generally all basal, whorled or 3-ranked; blade generally present, at least on distal sheath, smooth, or margin minute-scabrous; sheath closed, long; ligule glabrous. Inflorescence: terminal, branch stems often scabrous, main inflorescence bract like leaf blade; spikelets ovate, not +- flat, many-flowered; flower bracts spiraled, each with 1 flower in axil, ovate, 1-veined, brown to straw, dull, often fine-lined-spotted, membranous, generally +- scabrous, tip generally notched, generally with short awn. Flower: bisexual; perianth bristles +- straight, +- <= fruit, generally brown, reflexed-barbed (or with soft hairs) [(smooth)]; stamens generally 3; style 1, thread-like, base not enlarged, stigmas 2--3. Fruit: generally obovate, brown, generally smooth, mucronate; tubercle 0. Schoenoplectus pungens (Vahl) Palla var. longispicatus (Britton) S.G. Sm. Habit: Perennial herb 1--20 dm; rhizome long, 1--6 mm diam. Stem: 1--6 mm diam, sides 3, flat (to deep-concave), edges sharp. Leaf: blades 2--6, +- 3-sided to +- flat, distal (1)2--5 × sheath, 2--9 mm wide, sheath not splitting. Inflorescence: head-like; inflorescence bracts 1--2, generally erect, 1--20 cm; spikelets 1--5(10), 5--23 mm, 3--5(7) mm wide; flower bract 3.5--6 mm, midrib, awn often sparse-scabrous, sparse-deciduous-ciliate, tip notch (0.3)0.5--1 mm, awn 0.5--2.5 mm, generally irregularly bent. 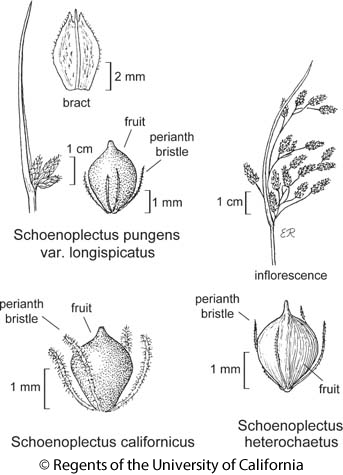 Flower: perianth bristles (4)6(8), vestigial to = fruit; stigmas 3. Fruit: (2)2.5--3.5 mm, 1.3--2.3 mm wide, 3-sided, smooth. Synonyms: Scirpus americanus Pers. var. longispicatus Britton; Scirpus americanus subsp. monophyllus (J. Presl & C. Presl) T. Koyama, in part; Scirpus pungens Vahl, in part; Schoenoplectus pungens var. badius (J. Presl & C. Presl) S.G. Sm. Unabridged Note: Schoenoplectus pungens var. badius only differs in its dark chestnut flower bracts, coastal range, and so is not recognized here. Schoenoplectus pungens var. pungens in eastern North America, Europe. Citation for this treatment: S. Galen Smith 2012, Schoenoplectus pungens var. longispicatus, in Jepson Flora Project (eds.) Jepson eFlora, http://ucjeps.berkeley.edu/eflora/eflora_display.php?tid=81092, accessed on April 23, 2019. NCo, SN, SnJV, CW, SCo, GB, D; Markers link to CCH specimen records. Yellow markers indicate records that may provide evidence for eFlora range revision or may have georeferencing or identification issues. Purple markers indicate specimens collected from a garden, greenhouse, or other non-wild location.